Alperstein’s Aboriginal Art collection has come to adorn some adorable little teapots that feature the artworks of some of Australia’s finest artists. With their bold colours and amazing designs, these tea pots do true justice to the works on which they’re based…and you’ll find them really handy too! Debbie Brown lives in Nyirrpi, a remote Aboriginal community 400kms north-west of Alice Springs. In her paintings, Debbie depicts Dreamings which relate directly to her land, its features, plants and animals, based on stories passed down to her by her ancestors. Her painting, Yarla Jukurrpa (Bush Potato Dreaming), depicts the dreaming of the ‘yarla’ (bush potato) ‘wapirti’ (bush carrot) ancestors fighting a big battle in the area of Cockatoo Creek. 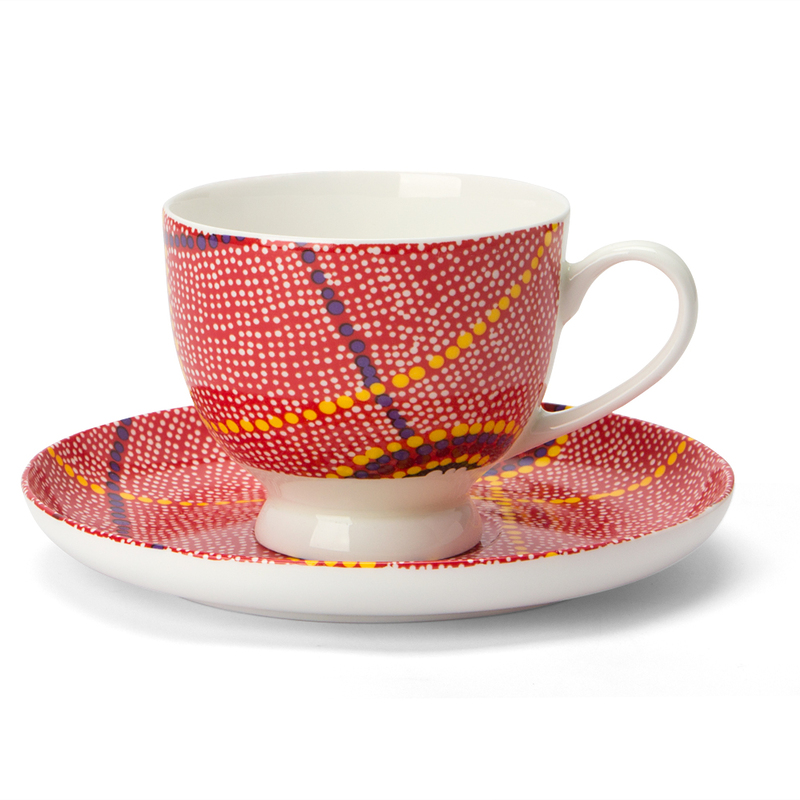 This gorgeous painting with its colourful, intricate design, is fantastically featured on this fine bone china Tea Cup Set from Alperstein, to accentuate the enjoyment of teatime. Design: “Yarla Jukurrpa (Bush Potato Dreaming) – Cockatoo Creek” by Debbie Napaljarri Brown.